I have a similar process. I believe that if I clean them up to a really clear sharp image first, before compressing them, then the result will be more readable. It makes sense to me anyway but I'm no "graphic designer". No I checked they are 120 dpi, but the document measures 5x8 so if someone "fits to paper" when printing the resolution will go funky. As long as they print "as is" 120 should be fine. I'm combining this into a PDF and will put on my webserver then post a link, here. BTW: it looks like pp. 114 isn't here. Can you please post that? Let me see if I can run a few of the Adobe macros over this to clean it up. I can't change the pixelation. BTW: 150 dpi is good for general black & white documents without photos. But, if you're digitizing a book, it's better to do 300 dpi greyscale. If you have Adobe Professional, you can create a document from the scanner, then publish it is several different resolutions, keeping the highest resolution for archives. Page 114 is there, at the start of post #9. I have now done a comparison and I think that if I keep the resolution at 300dpi and reduce the size to 40% original, I can keep a bit more integrity with a similar file size. Does that sound right? I have 3 more sections to do on the other book so I can do that if you think that is right. I am sorry to have wasted everyone's time if they are no good. I don't know what else to do. I found pp 114. But, I can't find pp 181. Acrobat has a number of tools for projects like these. I can automagically de-skew and de-speckle pages while Acrobat manages my scanner for me. I also have the ability to resize objects manually, flip over into photoshop to clean up images, etc. @JC - I know you aren't - I am disappointed that with my lack of understanding and simple programming I have produced a less than perfect copy and now someone else has to fix it. I wish that I was able to offer a better copy in the first place, so that didn't need to happen. I will add this to my list of things to buy before I try this again. For the mean time, do you think that the alternative I suggested will help? As for pg 181, it is there as the appendix however page 180 was blank so I left it out. I should have said that. No worries. If you want, you can email me the scanned images and I can compile them. I'm not being super professional about them. I'm just running automated tools. Acrobat's doing all the heavy lifting. If I were to republish these books (a la RL Shep), I'd clean every page and edit the typography. I have rescanned and replaced the pages with photos at a higher dpi, they may appear dirtier but the photos are clearer. Enjoy. I have pinned this book because it is very good. However, beginners must keep in mind that there are many things here that are fairly old fashioned, such as the way the ironwork is conducted. The fundamentals are still extremely well explained. I just wanted to pass along my thanks for that post! That's what you call dedication!! His explanation of the buttonhole stitch IMO is well written. Nothing unessential in his writing and always stressing that working with care is "just as easy as doing it in a slovenly manner." In fact his entire stitch tutorial is good to me. I know that much of what he writes is out of date, but what isn't combined with modern methods and tools, can really help a beginner not get ahead of himself. I wish I had the time to make something completely by hand, as he seems to prefer. I plan on reading the entire book, (thanks TT), and making something simple to start. This, along with a few shirt projects, will keep me busy. This is one thing I tried to do in my book. I have a very detailed section on the formation of handstitches as well as a little about why and where it is used. A solid foundation will never fail! why don't you make a PDF file yourself and share it? I already consolidated the pics into a PDF file and posted it to my web server. One thing I just wanted to comment on. 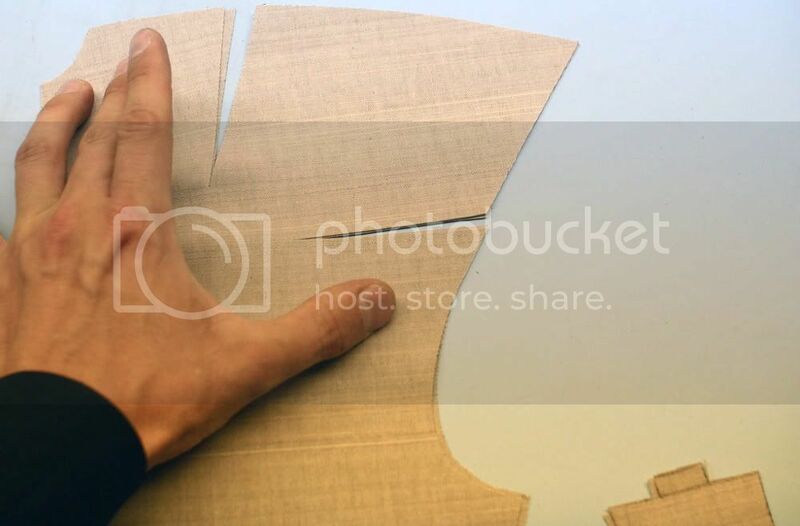 The way the canvas is cut mirrors the ironwork on the coat, except instead of stretching and shrinking you can easily open up wedges and remove darts from a canvas. This is necessary to do partly because chest canvas does not take to the iron well. Note how there are three armscye cuts (which are opened up), the lowest of these being quite deep in the armscye. The ironwork on the coat would mirror this, and the stretching of the armscye would be allowed to extend quite deep into the armscye. 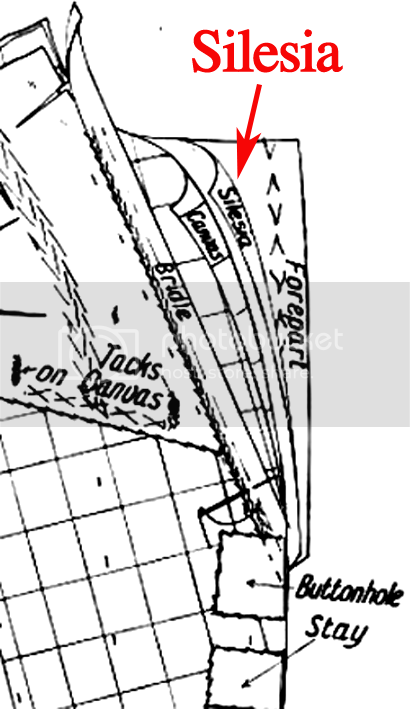 This helps to advance the neckpoint forward, and opens up the cuts in the armscye of the canvas. The ironwork on the coat follows this and should be not be extended down into the base of the armscye, as this tends to straighten the neckpoint excessively. 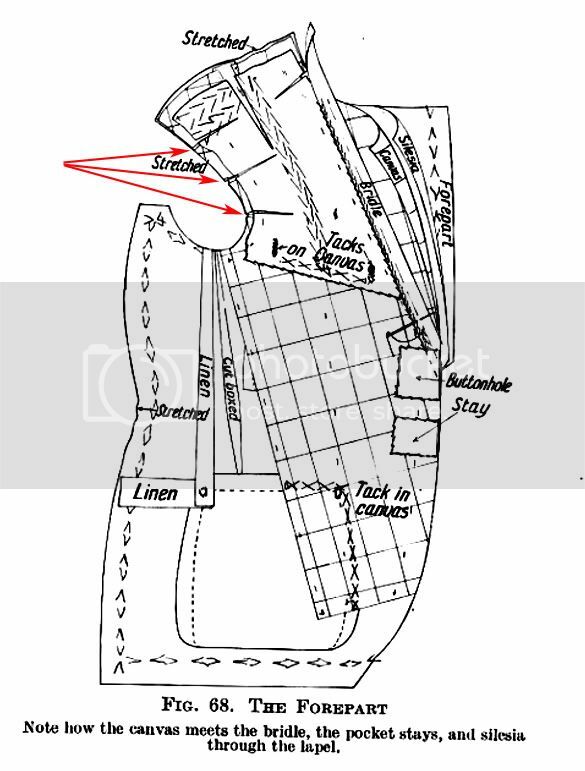 In modern tailoring, the stretching should be restricted towards the area of the armscye closer to the shoulder point. It should be gentle and not as vigorous as on an old fashioned crooked coat. Note too that the book shows the canvas on the partial bias. It is possible that older authors liked this because it made the canvas softer as period wool-hair body canvas was apparently quite stiff and heavy. Modern wool-hair body canvas is already very soft by comparison, and it is possible this makes it redundant to cut the canvas on the bias. Did anyone notice the way the author gets you to insert a piece of silesia? This is a pretty old fashion practice that you don't commonly see these days. I noticed it. I usually use a light wigan, but silesia should be fine. On step lapel, it can sometimes be "forgotten", depending on the cloth and canvas. On peak lapel, I find this additional reinforcement necessary for a crisp peak.